I headed eastwards from Berechurch into the parish of East Donyland. This exists in name only, there is no village, just a hall, but in the 19th Century there grew up on the south bank of the Colne the township of Rowhedge. I was suprised that the road signs suggested that I head back into central Colchester and then out again, when my map clearly showed a lane leading directly across to the place, but this turned out to be a gated road, the gate with a sign saying 'This gate is closed when Live Firing is taking place'. Fortunately it was open, although there were more warning signs all the way along the verge. I eventually came to St Lawrence. Locked, no keyholder notice. The sign outside says 'Parish of East Donyland'. The setting is wholly urban, the churchyard surrounded by 19th century terraced streets punctuated by the surprise of wooden sail lofts. Now, I'm not saying that I would not have gone inside had it been open, but the significant thing here is the architecture, for unusually this is an octagonal church in white brick of 1838, wholly un-ecclesiological but, as you see by the date, just Victorian. 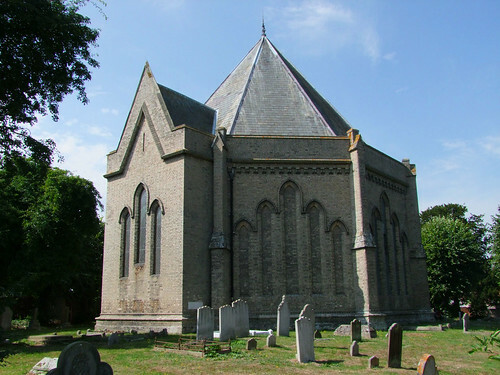 The architect was William Mason of Ipswich. It looks extremely odd, like an eastern temple shoehorned into a 19th Century housing estate. It was hard to work out which way was east without an apse. I knew I was now entering an area of fearsomely locked churches, and I would have liked to have seen inside, but I was glad I'd seen the exterior. I wandered down to the Quayside, a lovely area of 18th and 19th Century buildings, albeit with some modern apartments, and people sitting outside pubs on the waterside. A few hundred yards down river on the opposite bank is Wivenhoe, with people sitting outside the pub there. If I had waved to them they would probably have waved back, and it where I was bound, but it would take me nearly ten miles to cycle to get it.